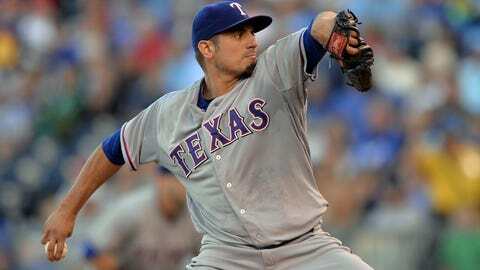 Matt Garza went 10-6 with a 3.82 ERA last season in 24 starts with the Cubs and the Rangers. The Milwaukee Brewers have reportedly made their first big free-agent signing of the winter, agreeing to a four-year, $52 million contract with right-hander Matt Garza. The agreement between Garza and the Brewers was first confirmed by FOXSports.com’s Ken Rosenthal. The Brewers, however, issued a statement Thursday evening saying "Despite media reports, negotiations between the Brewers and Matt Garza are ongoing, but there is no deal yet." Garza was one of the top starting pitchers still on the free-agent market. The 30-year-old went 10-6 with a 3.82 ERA last season in 24 starts with the Cubs and the Rangers. Unlike the Kyle Lohse signing of a year ago, the Brewers will not have to forfeit a draft pick to sign Garza. Injuries have held Garza back in recent years, but he’s been a solid top of the rotation starter when healthy. Garza joins Lohse, Yovani Gallardo, Wily Peralta and Marco Estrada to suddenly give the Brewers a rotation that looks good on paper. Tyler Thornburg was expected to come to spring training as the fifth starter, but Estrada likely has the inside track heading into spring training. Beginning his career with Minnesota in 2006, Garza broke out in three seasons with Tampa Bay. He was traded to the Cubs in January of 2011, posting a 3.45 ERA in 60 starts over three seasons in Chicago. Garza was dealt to the Rangers last July for pitching prospect Justin Grimm and third base prospect Mike Olt. He went 4-5 with a 4.38 ERA in 13 starts for Texas down the stretch. The Brewers are showing confidence in Garza’s health, as the right-hander has made four trips to the disabled list since 2009. Three of those disabled list trips were due to elbow injuries. Garza was limited to just 18 starts in 2012 because of a stress reaction in his elbow. He missed the first seven weeks of 2013 due to a lat strain suffered while rehabbing his elbow. A fiery competitor, Garza has let his emotions get the best of him at times. It is well documented that Garza has struggled to field and throw bunt attempts against him recently and Oakland decided to test him by bunting last August. Garza went on a rant on Twitter after the game, calling out Athletics second baseman Eric Sogard and Sogard’s wife. He later apologized saying he "let his competitive spirit cross outside the lines." According to Fangraphs.com, Garza’s four-seam fastball averaged at 93.2 miles per hour last season. His primary offspeed pitch is his slider (84.8 mph average), which he threw 23.7 percent of the time in 2013. Garza also throws a two-seam fastball, a curveball and a changeup. Garza carries a 67-67 record with a 3.84 ERA in 194 games and 191 starts over his eight-year career.